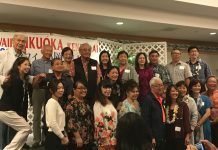 Members of the Honolulu Hiroshima Kenjin Kai held their annual membership meeting and shinnen enkai on March 13 at the Japanese Cultural Center of Hawai‘i’s Manoa Grand Ballroom. Attendees were greeted with a sip-size sample of Kamotsuru Gold Sake, a Hiroshima-brewed sake, and the thunderous taiko sounds of Dragonbeat. HHKK president Wayne Miyao presided over the general meeting, calling on the various committee chairs to report on their respective areas of responsibility. Co-treasurer Thomas Sakamoto thanked members for their donations, which has left the club in good financial health. Ehime Maru Memorial clean-up co-chair Ken Saiki reported that 17 members turned out for the April 5 clean-up of the memorial at Kaka‘ako Waterfront Park and for the Hiroshima Torii in Mö‘ili‘ili. Saiki said the two times a year that HHKK members clean the memorial is “a fitting tribute to the nine who died” in the collision between the Ehime Maru and the USS Greeneville in February 2001. Picnic co-chair Peter Kobayashi reported on the club’s 2015 summer picnic. His priceless moment was watching those members needing walkers participating enthusiastically in the “golden harvest” of vegetables. This year’s picnic will be held Sunday, Aug. 14, at Ala Moana Park, Area 9. Megumi Honami, who co-chaired the HHKK’s okonomiyaki booth at the JCCH ‘Ohana Festival, reported that the club sold 892 okonomiyaki this year — a 40 percent increase over last year’s total. Okonomiyaki is pancake-like dish containing a variety of seafood, meat and vegetables. The kenjinkai was fortunate to have had an okonomiyaki master chef come from Tökyö to assist in the production. Honami also acknowledged Hiroshima’s Otafuku Sauce Company for its donation of the sauce for the festival favorite. Twenty-five student volunteers from Moanalua and Roosevelt high schools bolstered the kenjinkai’s labor crew. This year also marked a major milestone for HHKK, selling a grand total of 10,000 okonomiyaki over the 14 years that the club has been making and selling okonomiyaki for the ‘Ohana Festival. Proceeds from the sale are used primary for educational purposes, such as to fund college scholarships and the student exchange program. Student exchange/scholarship co-chair Sandra Ishihara-Shibata reported on Arianna KirschenBaum’s trip to Hiroshima, which was underwritten by the Hiroshima Prefectural Government. Arianna was unable to attend the shinnen kai, but she submitted a report that Ishihara-Shibata read to the audience. In it, the Punahou School student called the experience to travel to Hiroshima “a truly amazing experience” that enabled her to meet her aunt, as well as students from other parts of the world. The students visited with Hiroshima Gov. Hidehiko Yuzaki. She said she danced hula for a cultural presentation and enjoyed her homestay in Fukuyama, where she attended the Fukuyama Matsuri. Arianna also visited the Hiroshima Peace Museum, the Otafuku Museum, Mazda Factory, witnessed a kagura performance and saw the roaming deer in Miyajima. “It was just a great learning experience,” she concluded. Ishihara-Shibata also announced that the kenjinkai’s $1,000 scholarship was awarded to Sean Yamamoto, a graduate of Mid-Pacific Institute, who is attending Washington State University. 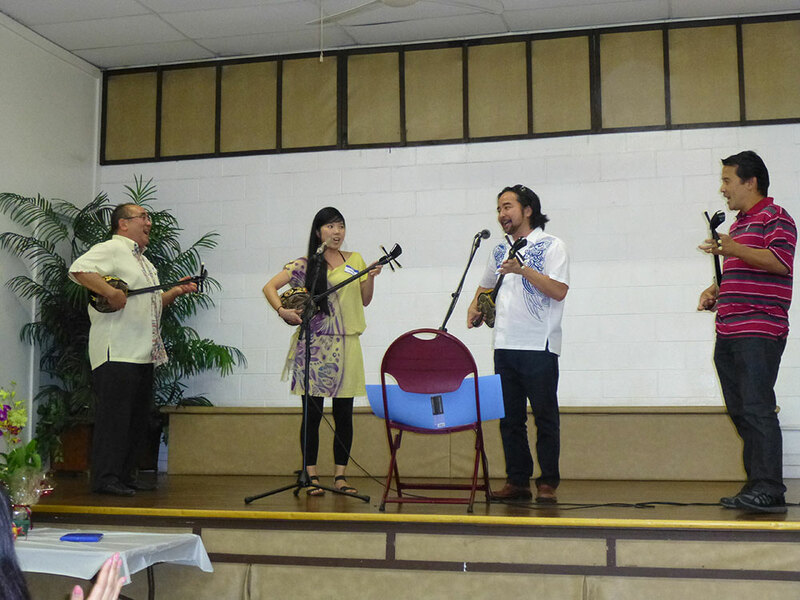 Afuso Ryu sanshin sensei Grant “Sandaa” Murata (far left) and Kenton Odo (far right) and sanshin students Hanae and Mark Higa performed several songs for Deigo Club members. HHKK president Wayne Miyao said it has been an honor and a privilege to lead the kenjinkai. He said the opportunity to work with so many members in preserving, perpetuating and promoting the culture of Hiroshima has been one of his most cherished memories. This year will mark the 20th anniversary of the Hawai‘i-Hiroshima Sister-State relationship and an “ambitious” schedule of events and activities is planned. A delegation from Hawai‘i plans to travel to Hiroshima this year to celebrate the milestone with their “cousins” there. 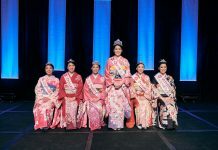 Miyao encouraged the members to continue being Hiroshima goodwill ambassadors of aloha and to work at strengthening partnerships and relationships between Hawai‘i and Hiroshima. Kampai were offered by Consul General of Japan Yasushi Misawa and state Sen. Brian Taniguchi, who has ancestral roots in Hiroshima. The kenjinkai’s 2015 outstanding member award was presented to Darek Sato. 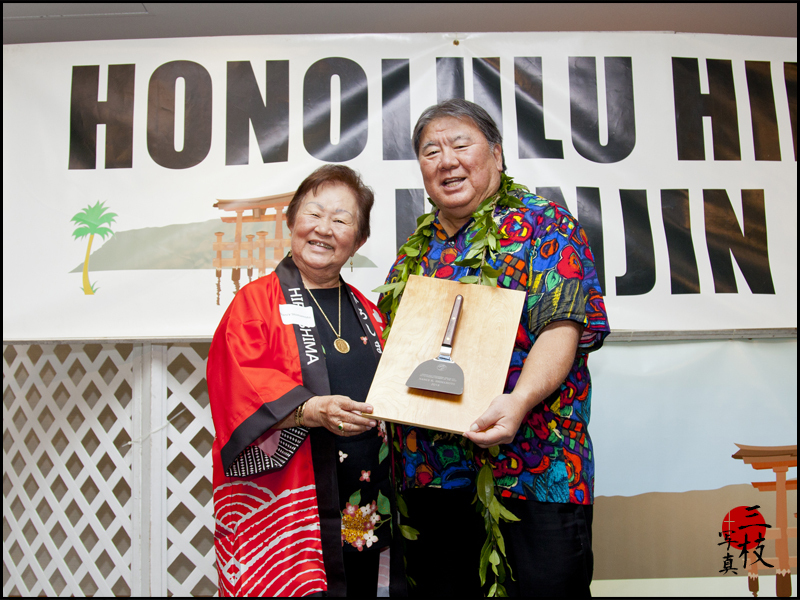 The 2016 award, a mounted okonomiyaki spatula, was presented to Nancy Shimamoto. year. They are: Laura Fumie Amimoto, Charlotte Matsue Yamashiro and Kate Kitako Yashima. They were presented certificates of commendation that had been prepared by Hiroshima Gov. Yuzaki and sent to Hawai‘i. 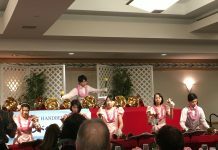 Entertainment was presented by Cheryl Sora and her Honolulu Wind Ensemble Flute Choir; Megumi Honami, who sang a song; and Alyssa Fujihara, who performed a classical Japanese dance. 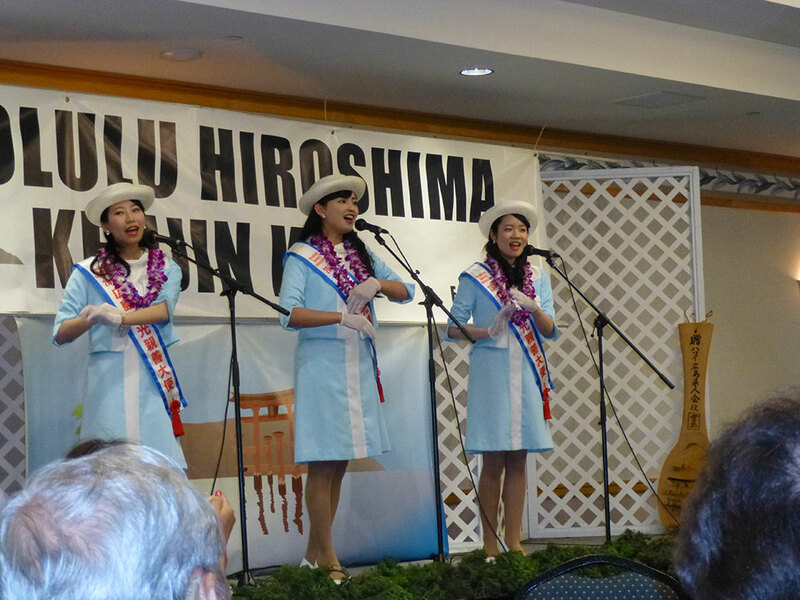 The guests were also entertained by 2015 Hiroshima Goodwill Ambassadors Nanako Sakata, Moena Kawasaki and Rie Yamashita, who serenaded the group with their uplifting “Hiroshima Kibun” rendition and a Begin/Keali‘i Reichel arrangement of “Nada Sousou.” This year marks the 51st goodwill visit to Hawai‘i by representatives of the Hiroshima Convention & Visitors Bureau and Hiroshima’s Tourism Promotion Department. The delegation from Hiroshima was scheduled to participate in the Honolulu Festival parade through Waikiki later that afternoon. 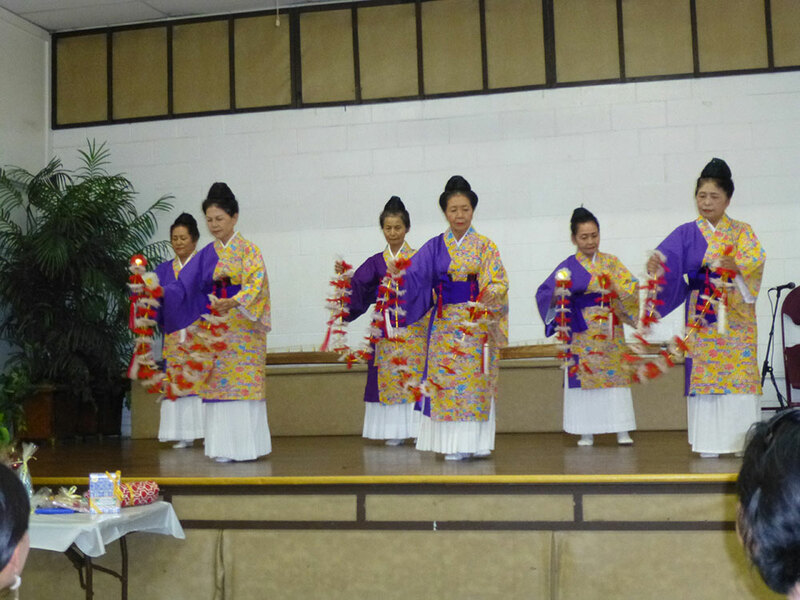 The shinnenkai concluded with immediate past president Robert Nagao leading everyone in a festive tejime.